Qing-Chang Zhong came to the United States just over three years ago with a paradigm-shifting power invention and motivational scrolls in his native Chinese language, joining the Department of Electrical and Computer Engineering that featured Illinois Tech notables such as Lee DeForest (faculty member from 1899–1901), Marvin Camras (EE ’40, M.S. ’42), and Martin “Marty” Cooper (EE ’50, M.S. ’71). 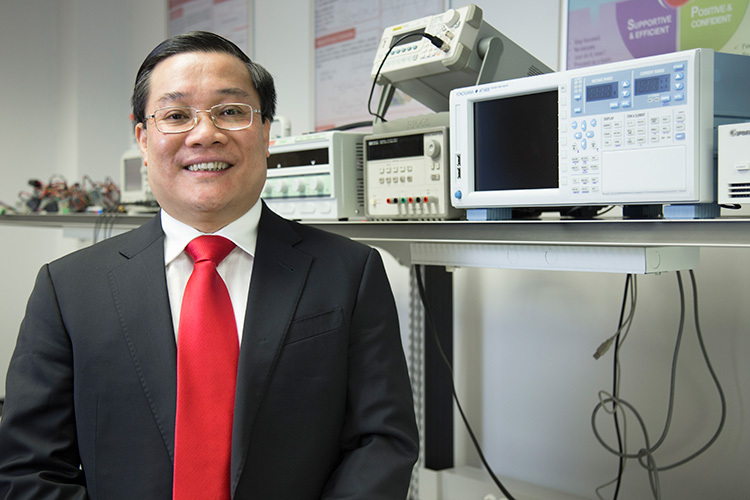 Z. John Shen, Grainger Professor of Electrical and Computer Engineering, recruited Zhong to Armour College of Engineering after meeting him at a conference and hearing about the power electronic converter control system he began to both think about and develop at Imperial College London in 2001. At Illinois Tech, Zhong founded the startup SYNDEM and acquired new supporters, including David Baker, founding executive director of University Technology Park at Illinois Tech and now head of the tech consultancy Fremont St. Associates, and Jim MacInnes, engineer, chair of the Michigan Utility Consumer Participation Board, and chief executive officer and co-owner of Crystal Mountain resort, home to the first LEED-certified spa in the Midwest. MacInnes explains why Zhong’s concept is crucial to existing power systems around the U.S. and other countries that use traditional grid technology. “Massive synchronous machines in central station power plants have long relied on rotational inertia to provide grid stability; however, as large aging plants are being retired, millions of smaller and environmentally cleaner distributed energy resources (DER) such as wind generators, solar PV [photovoltaic] installations, battery storage, and other widely disbursed smaller generators are in the works to replace them,” explains MacInnes, named a “Michigan Green Leader” by the Detroit Free Press in 2010. MacInnes explains that the grid will become increasingly unstable as more nonsynchronous alternative energy resources are added to it over the next 20–30 years. Zhong’s “synchronized and democratized” (SYNDEM, in short) approach for smart grid integration has its philosophical roots in ancient China. Born in rural Sichuan province, Zhong says he was influenced by the Tao Te Ching and the history of his homeland, which was highly democratized some 2,300 years ago before becoming unified, and then characterized by increased stability and harmony. While he acknowledges that power systems are moving toward a decentralized “democratic” future, he posits that power systems should not only be democratized technically—but also all power system players need synchronize their actions toward the common goal of stability of frequency and voltage, a harmonious outcome. 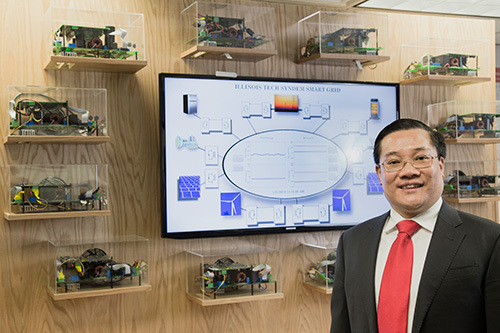 Working in partnership with the the global connections he has made in academia and industry while promoting his idea, Zhong says that he is taking steps toward commercializing his power converter system. He also oversees a laboratory team of postdocs and graduate students who are helping to further refine and test the power converter system. Inspired perhaps by the Tao Te Ching quote “When you are content to be simply yourself and don’t compare or compete, everyone will respect you,” he motions to a large paper scroll hanging on the wall above his computer station that he asked a Chinese calligrapher to prepare for him.